The darkest day of Kimberly's (not her real name) depression came when her long-time psychiatrist told her she obviously was choosing to resist the healing effects of one medication after another, psychotherapy, electric shock. "You must be getting some emotional payoff that prevents you from letting your depression go," he said. "Secretly, you must enjoy being this way." Growing up in Georgia, Kimberly was a serious, unsmiling child. Growing up, she often felt sad. During and after college, she managed it all—school, then work and marriage—with the help of antidepressants. Her plunge into suicidal darkness began in her late 30s. Could it be hormonal? Her gynecologist shook her head, then told Kimberly about an Emory neurologist named Helen Mayberg she had just read about, who was doing a special type of brain surgery with electrodes for treatment-resistant depression, with promising results. You have a physical illness of the brain, the gynecologist said. This might be your best hope. Fifteen percent of Americans have clinical depression during some portion of their lives. A third of those have major depression: suicidal thoughts, a sense of disconnection from the world. For a few of those, the entire arsenal of traditional treatments—therapy, medications, even electroconvulsive therapy—doesn't work. These are the patients Mayberg sees. Kimberly was a model case. Indeed, her long-term depression was so severe, it made it difficult for her to gather the required documentation and go through the long psychiatric interviews. 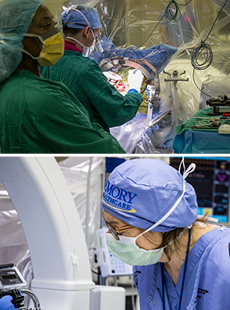 The day of surgery, Emory neurosurgeon Robert Gross implanted very thin wires with tiny electrodes in two small lobes deep at the midline of Kimberly's brain. 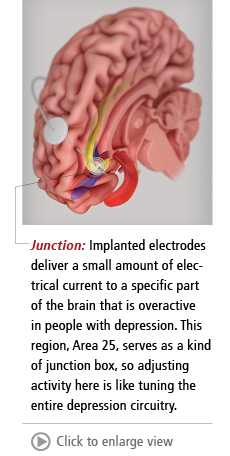 The electrodes' job is to deliver a small amount of electrical current to the specific region of the brain Mayberg discovered is overactive in people with depression. This region, Area 25, serves as a kind of junction box, so adjusting activity here is like tuning the entire depression circuitry. The electrodes are connected to an implantable pulse generator (IPG), a pacemaker-like device placed under Kimberly's collarbone. The IPG keeps a steady stream of low voltage flowing into the patient's brain. As the electrodes are tested in the OR, patients often report an emotional weight being lifted instantaneously—one way the team knows the electrode is in the right place. Within a week after surgery, with the electrical current flowing continuously, Kimberly began to notice sunlight, birdsong. Her sense of humor returned. Her boss didn't recognize her on the phone, so changed was her voice. 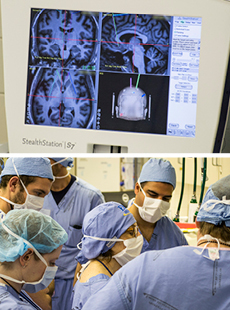 The deep brain stimulation (DBS) team stands at the ready behind the patient's skull, planning the surgical target for the electrodes that will be connected by a thin wire to the battery-powered pulse generator implanted under the patient's collarbone. Neurologist Helen Mayberg (above), who pioneered the use of DBS for patients with treatment-resistant depression, speaks with the patient, who is awake and alert and providing feedback. Many times, as soon as the device is turned on in the operating room the patient will feel an immediate lightening of mood—an indication that the electrodes are in the right place. Two years later, Kimberly says the procedure has been transformative. "It brought me out of the pit," she says. "People who haven't been there can't understand what a gift it is to feel joy. I always loved my family. Now I enjoy them." Her child doesn't remember the mommy who cried every day, only the happy one. They enjoy horseback riding and playing in the park. Before deep brain stimulation (DBS), Kimberly felt completely dependent on her husband. After the procedure, she feels like an equal partner—and it's fun, she says: "Laughing like we used to, motorcycles, camping, Georgia Tech football, happy times with my family." She recently started training for a 5-K race, determined to be as healthy physically as she now feels mentally. Her husband refers to her as "the new and improved version." This major shift in mood and energy level took some getting used to, however. "After 30 years in a kind of prison, it was a big adjustment to suddenly be well," says Kimberly. "I didn't know what to do, what to feel." The research team's responsibility doesn't end in the OR, says Mayberg. Kimberly receives ongoing treatment from behavioral therapist Cynthia Romero, psychiatrist Patricio Riva Pose, and the rest of the DBS research team. Now that Kimberly's brain is able to focus, thanks to the "reset" of DBS, she is learning to enjoy the moment, to not dread the future, and—hardest of all, she says—to let go of the guilt about what her family went through during her illness. As a neurologist, Mayberg's territory is the brain, and her maps are the neural circuits that go awry in depression. She's also a dedicated clinician, determined to retune those circuits and give patients back their lives. Entering medical school in the late 1970s, Mayberg planned to become a psychiatrist. At the time, however, psychiatry had not fully embraced the genetic and neural underpinnings of mental illnesses, focusing instead on causes like maternal neglect or suppressed anger. Inspired by a mentor, Mayberg switched to neurology and began investigating how faulty neural communications might contribute to mental disorders. Positron emission tomography (PET) was starting to make it possible to actually see brain activity. Mayberg took extra training to learn this new nuclear technology, inside and out. She worked first with stroke, then Parkinson's patients, but began to hone in on depression. "Some clinical decisions just call to you," she says. As a research fellow at Johns Hopkins, Mayberg worked down the hall from neurologist Mahlon DeLong, who had discovered pathways in the basal ganglia, a part of the brain associated with movement and cognition—pathways that he believed could explain the symptoms of Parkinson's disease. DeLong was interested in the patient's movement problems, but what interested Mayberg was the depression experienced by some, but not all, Parkinson's patients. The severity of the movement disorder seemed to have no bearing on which patients became depressed. Mayberg asked herself if the depressed patients could be wired differently. Working with many of DeLong's patients and drawing on his model of distinct patterns of brain activity related to movement problems, she used her new imaging skills to find the answer. In PET imaging, a tiny amount of radioactive material is attached to glucose molecules and given to the patient intravenously. Glucose is the brain's biggest source of energy, so the brain grabs the molecules from the circulating blood to fuel its various activities. The most active regions show up as brilliant red or yellow, the less active in muted green, blue, or black. Mayberg's findings were stunning: Parkinson's patients who were depressed all had less brain activity in the frontal and limbic regions responsible for thinking, emotion, memory, and learning. She broadened her investigation. Depressed Huntington's patients had the same pattern. So did depressed stroke and epilepsy patients. So did depressed patients with no neurological disease. Then things got even more interesting. When depressed patients took Prozac or other antidepressant drugs and improved, their depressed frontal lobe activity corrected, rising again. But activity lowered in a different area of the brain, Area 25. When healthy, non-depressed research subjects were told to think about sad memories, activity in the frontal cortex went down and activity in Area 25 rose. When the subjects switched to happier thoughts, activity in Area 25 dropped and activity in the frontal cortex increased to normal. Clearly this was a clue into how treatments worked. But for certain patients, activity in Area 25 stayed high and activity in the frontal lobe remained low, despite treatment. Mayberg believed that in these "treatment resistant" patients, a brain glitch was preventing signals from traveling between Area 25 and the frontal lobe, trapping the person in a kind of depression loop. She had found her target. "If we couldn't talk depression down, couldn't drug it down, couldn't shock it down, then I believed we could go directly to Area 25 of the brain and tune it down," Mayberg says. Some might call this a daring leap, but when Mayberg proposed placing electrodes in Area 25 to her University of Toronto colleague Andres Lozano in 2003, where she was then professor of neuropsychiatry and neurology, she viewed it as simply the next logical step. "I have never been a risk-taker," she says. "I was following 20 years of evidence I and others had gathered about how brain circuitry works in depression and where an electrode might need to be placed if we wanted to change that circuitry in severely ill patients." Lozano and other surgeons already were inserting electrodes into the basal ganglia of patients with intractable movement symptoms, based on DeLong's work. But even when these procedures were successful in reducing the rigidity and uncontrollable body movements of Parkinson's, they did nothing to affect depression. Depression, as Mayberg had discovered, hid in a different region of the brain. With funding from the Brain and Behavior Research Foundation, Mayberg and Lozano began a pilot study. Of 20 patients who received the DBS procedure in Toronto under Mayberg's direction—patients for whom all other treatments had failed—12 experienced significant clinical benefit. People who had been suffering profoundly, some of whom were suicidal, were now describing feelings of rejuvenation, of looking forward to something new and exciting. Colors were more intense. One spontaneously recalled the beauty of seeing a crocus blooming in spring. Hope, for the first time in a long while, was budding inside them. DBS surgery was proving successful beyond Mayberg's most optimistic estimates. Mayberg came to Emory in 2003 because of her belief in a multidisciplinary approach to depression, which dovetailed perfectly with the growing neuroscience initiative at Emory (headed by her former colleague, DeLong) that was bringing together researchers from a dozen departments and the Yerkes National Primate Research Center. She commuted back to Toronto to finish her work with the first cohort of DBS patients. At Emory, Mayberg and Robert Gross began a larger research trial of DBS, including patients with treatment-resistant bipolar II depression (a form with no manic episodes) as well as those, like , with severe unipolar depression. The first surgery was done at Emory University Hospital in 2008. Cases now number more than 30, with ever-increasing precision of electrode placement and, correspondingly, higher rates of clinical success. "Doing research like this takes a team," says Mayberg, the Dorothy C. Fuqua chair in Psychiatric Neuroimaging and Therapeutics. "We keep progressing because we have been successful in leveraging expertise across Emory, Georgia Tech, and labs worldwide." Recently, Mayberg and her team have turned their attention to understanding not if but how DBS achieves its effects. "I never thought depression was just about Area 25," she says. "It's always been about communication between multiple brain regions." A recent paper from her lab identifies three connections in the brain that must be affected for patients to improve. "Now," she says, "we understand better how to stimulate the entire depression circuit." No one knows why some depressed patients respond to one type of therapy and others to another type. Failing one treatment, trying another, failing, trying again, until something works—or finding that no treatment works long-term—is costly, agonizing, and even, given the suicide rate in depression, deadly. Understanding subtle differences in the brains of severely ill, treatment-resistant patients may identify the subgroup that can most benefit from DBS and even point to adjustments in target or intensity of stimulation that can convert non- or slow-responders into full responders. Mayberg's team is now able to read the brain signatures of people with depression who respond to different therapies. A new study is testing whether these patterns can guide treatment choices. The goal is to create evidence-based guidelines that will allow clinicians to select the best treatment for each individual with depression, much as now happens for breast cancer patients, whose type of treatment depends on their genetics and other biomarkers. Even newer studies focus on the "brain radio," an extra component built into the standard IPG pacemaker device. The radio continuously measures activity in depression-related areas of the brain—data researchers can use to tune stimulation up or down as needed, with a special magnet held against the patient's chest. They believe such precise tuning will lead to faster and longer-lasting recoveries. "I realize every day what DBS has given me," says Kimberly. When her mother died after a prolonged illness recently, she was able to be there for her and to handle her own grief in a way she couldn't have imagined before surgery. "I truly would have been paralyzed with depression before," she says. "Now, whether it is enjoying the good things or coping with the stress and loss that everyone experiences sooner or later, DBS lets me do life." 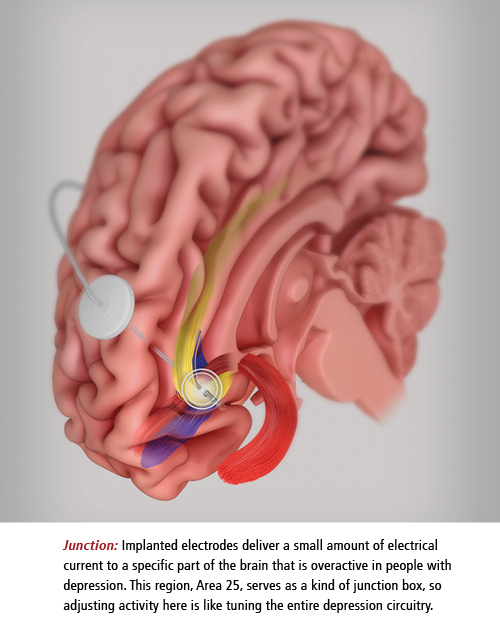 With a "pacemaker" that sends electrical impulses to electrodes surgically implanted in targeted brain regions, deep brain stimulation (DBS) has been able to reduce or eliminate the symptoms of depression, epilepsy, and movement disorders like Parkinson's, essential tremor, or dystonia. While not a cure (symptoms return if the implanted pulse generator is shut off), DBS does often result in remarkable recoveries in people whose lives had been severely disrupted by their illness. The departments of neurology (Mahlon DeLong, Thomas Wichmann), psychiatry (Helen Mayberg), and neurosurgery (Robert Gross) came together to form the Emory Neuromodulation & Technology Innovation Center (ENTICe) to advance the understanding and effectiveness of this therapy. The Neural Engineering Center at Georgia Tech is also a partner. "We are harnessing the synergy of basic scientists, engineers, clinical researchers, and industry to interact in an open, collegial, and creative environment."